“I’m soooo full!” I lamented by rubbing my belly while beads of sweat poured from my forehead. I was still recovering from the Thai chili pepper I just ate. After a satisfying lunch at Or Tor Kor, it was time for another culinary adventure to the Amphawa floating market to get our eat on, yet again. 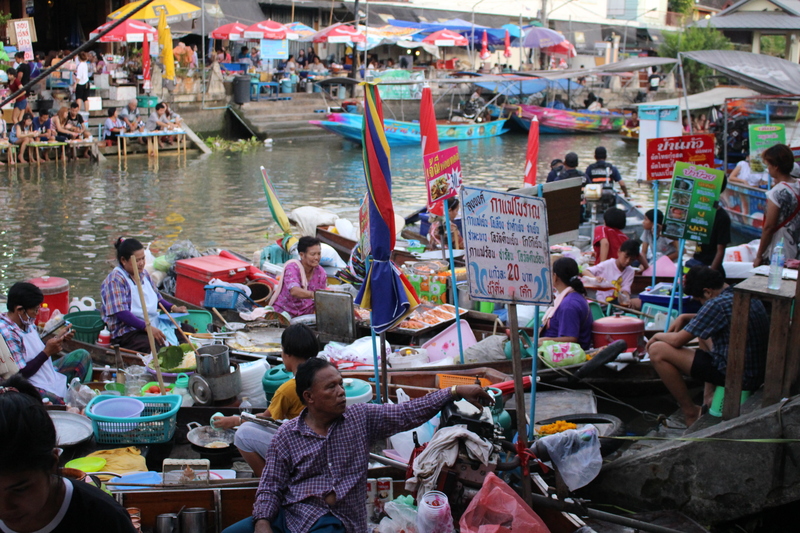 While there are day tours available to take you the floating markets around Bangkok (there are several famous ones in the outskirts of the city), like with anything else, the independent tourist can certainly do it alone. Bus, songthaew, or hired taxis will get you there, but Simon and I opted for the minivan experience as it seemed like the cheapest option. The minivans depart from Bangkok’s Victory Monument to Amphawa quite frequently, but traveler beware: get there early, especially on the weekends. Although the large open air parking lot was jam packed with dozens of little white vans, the next available tickets weren’t for another two hours. Bummed we wouldn’t make it there earlier, at least this gave us time to digest our lunch and work up an appetite for dinner. After an hour and a half riding in the b*tchseat of a cramped stuffy van, we finally arrived. The driver dropped us off at a dusty corner on a small street in front of an even dustier convenience store. We quickly purchased our return tickets from the ticket booth – which was just a lady seated at a table next to the store. We learned our lesson getting tickets here, and certainly didn’t want to make the same mistake again. There were no street signs and the sun was quickly setting on the horizon, but all we had to do was trust in the throngs of people and follow the herd. After all, what else could they be heading towards in this dusty part of town, miles away from Bangkok? Our trust paid off. Soon, we reached an ever bigger crowd, nestled in a bustling alleyway. 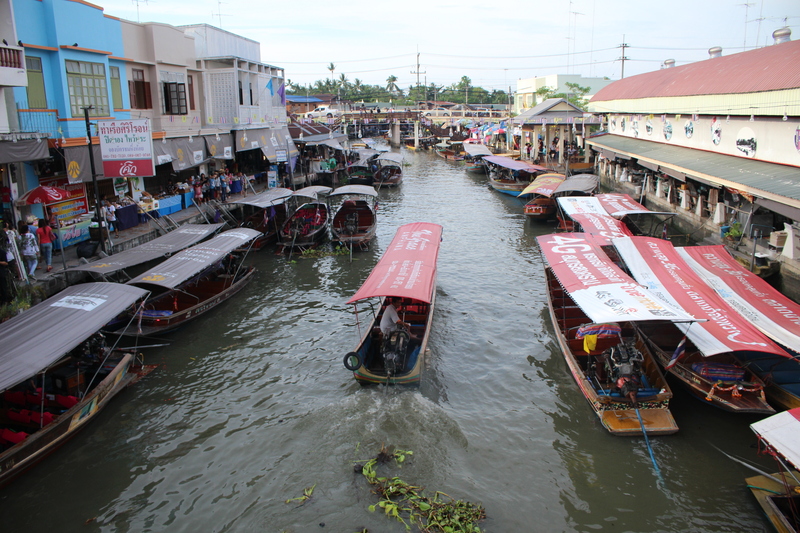 Just beyond that was clearly the most famous and main thoroughfare at the floating market. Above the small bridge arching over the canal was a huge purple sign. Adorned with a gold curly cue border and two golden elephants on top, it read “Amphawa Floating Market” written in Thai, Chinese, and English. Simon and I clasped our hands tightly and threaded our way through the crowd to the bridge, as if we were at an amusement park. We maneuvered around other tourists taking selfies, and past the food vendors and arts and crafts shops that were bustling on the edges of the already single file walkway along the canal. Like ducks in a pond flocking to crumbs of bread floating in the water, the murky brown canal was brimming with long-tail boats selling colorful fresh fruit, vegetables, and flowers – hence the name, floating market. But mostly, it was where they famously cooked up fresh seafood, satay skewers, and even noodle soups. The boats congregated to the edges of the canal to meet the hungry hordes of people perched upon little plastic stools atop the narrow concrete steps. 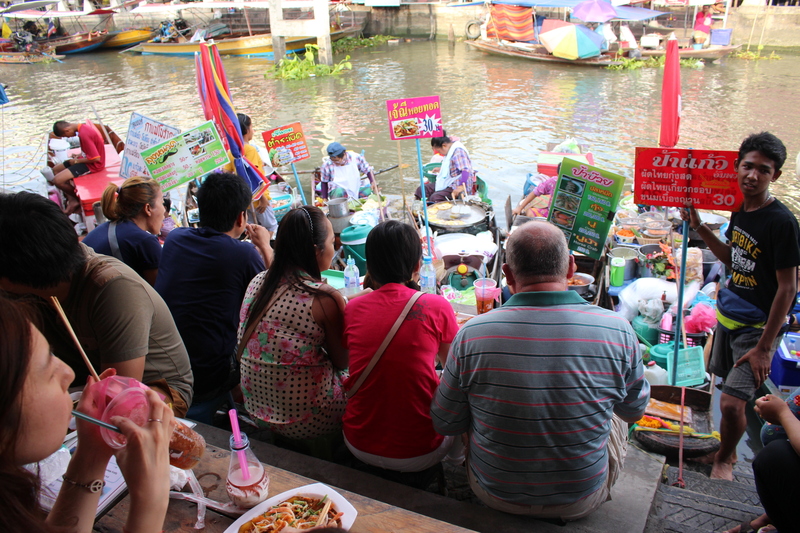 In other words, this floating market offered everything of a foodie’s delight that we encountered for lunch at the Or Tor Kor food market hall, the bonus being the added novelty of eating by a canal where food was cooked on boats. It was crowded and seating was limited, but it didn’t take us long to find two empty plastic stools on the steps. 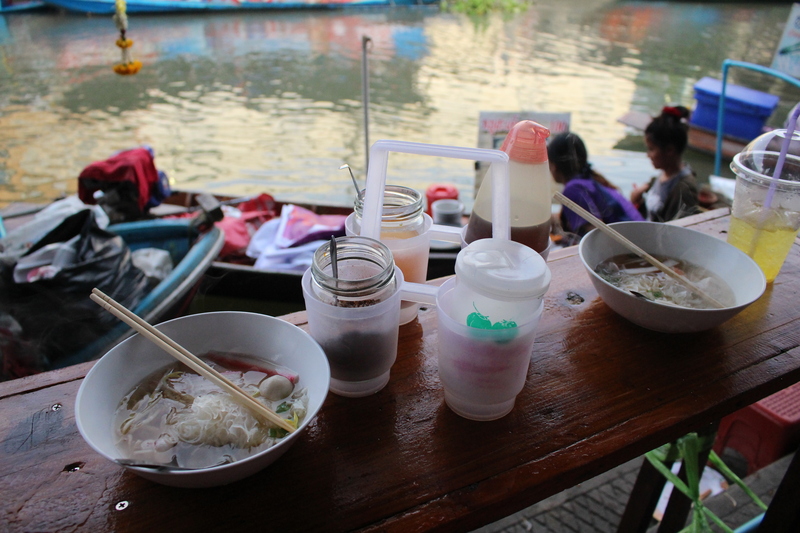 Although the food was not any more better than what we had sampled elsewhere, the experience of watching your meal cooked from a boat just made it that much more tastier, as if the jumbo prawns were freshly caught in the murky canal just steps away. 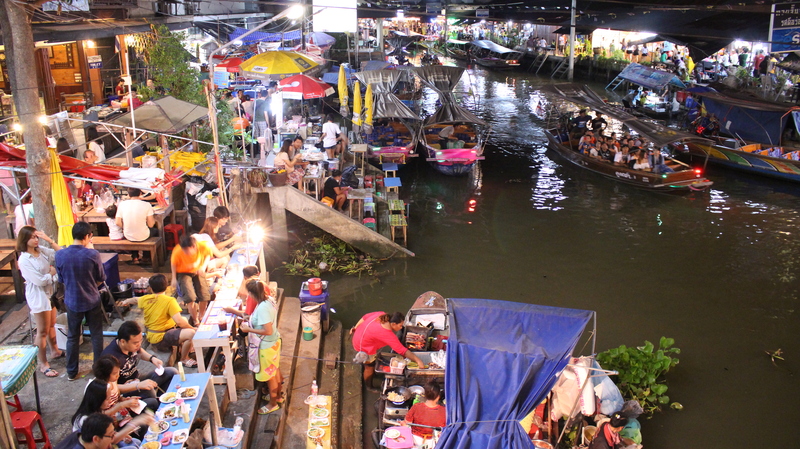 And when you think you can’t eat or shop anymore, the Amphawa market’s got Thai massages too. Located in the wooden houses just beside the canal, Simon and I treated ourselves to a relaxing evening on cloud nine in the form of a massage mat. Perhaps it was a combination of food coma and the masseuse’s dexterous fingers working her magic on all my paint points, but I quickly fell asleep, as the hum of floating market activity slowly floated away downstream.